What the F Happened?Military Police Archives - What the F Happened? Today I want to talk about the double standard of how Marching for Justice is a Double Standard in Ferguson, MO. Given the state of racism in America, there is a lot I could talk about. Trust me, I will be posting a lot of issues in this section for discussion. I can’t wait to read your comments and open the dialog. This discussion is about the Double Standard that is very real in Ferguson, MO for those Marching for Justice for Michael Brown. In and around St. Louis, supporters for the police officer that gunned down an 18-year-old unarmed young man named Michael Brown have been able to peacefully assemble in one place gathering and standing in one place to protest media bias and to show support for the police officer that gunned down and killed an unarmed Black Male (child). The problem I am having with this and the point I want to make and the issue I want to share with you is: The police in Ferguson, MO requires protestors to walk and march and not cross certain lines. These police tells the peaceful protestors to keep moving and not stop. This is a set up for failure. Real soon, people are going to get tired of walking and pacing. Heart rates are raised. It is 95 degrees at night. People are sweaty and irritable. When they stop marching and gather in huddles to rest or whatever – they violate the police’s orders to keep moving. The orders from the police, the military presence, the mixture of law enforcement that never worked together and do not even know each other, and do not live in the community, are all of a sudden in charge of controlling chaos. Out of anger or in response to something an officer said, threatened, or did, someone throws a water bottle. This gives the police the justification they knew would get so that they can become aggressive and start with the tear gas, releasing dogs, spraying pepper spray, and other means of brutal physical means of disbursement. WOW! Marching for Justice is a Double Standard! However, when I read the reports about what the protesters and supporters for the police officer that gunned down Michael Brown are doing to support their police officer, they are allowed to protest in the City of St. Louis and are allowed to stand in one place in large groups. No one is telling them to keep moving, walk, and don’t stop. No police or National Guardsmen are standing around with tear gas, military vehicles, guns, tie wraps, gas canisters, Semi-automatic and high-power automatic guns, billy clubs, attack dogs, gas masks, protective shields, patty wagons, and hundreds of law enforcement officers from the region that do not even know each other demanding the supporters for the police officer that gunned down Michael Brown to move or disperse. Marching for Justice is a Double Standard! Question for the people of Ferguson, MO. Is there an ordinance that details the process for civil protest or Marching for Justice? Did the ‘City Counsel’ or ‘County Commissioners’ establish rules of engagement for permitting and civil marches or protests? If not, then why is it that the police can make these rules for Michael Brown supporters and not enforce the same rules for the supporters of the police that gunned down Michael Brown? Where is the media on this issue? Marching for Justice is a Double Standard! Forcing people to walk and walk creates the friction when the people get tied. It is an old game and our leaders are falling for it. Stand with the rules of engagement and the law! Get a permit and organize people. Who is leading Black people? There is no leadership! 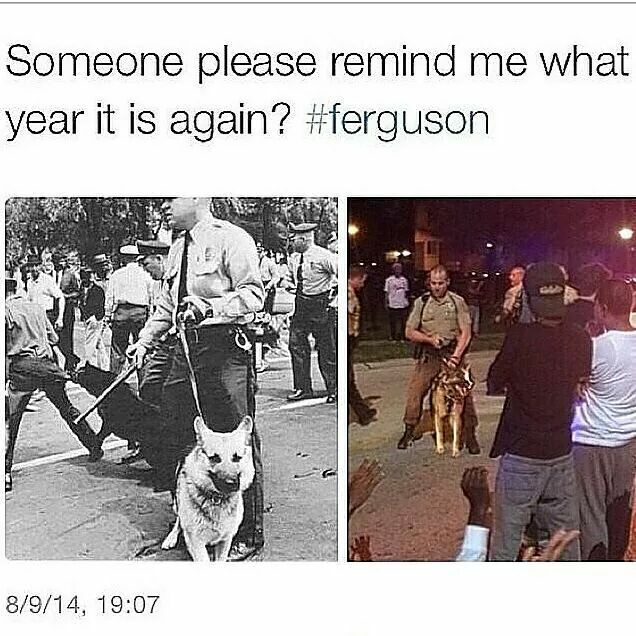 Now you understand the problem with Marching for Justice in Ferguson, MO. It is a Double Standard! Get on Google and search for this information. Research and read people. We need to be talking with every member of our family. This is not going away! America to the core is awaking up. Trust me, law enforcement sees the handwriting on the wall. These issues were set in place and the pressure in the cooker started building up when America decided that Black people are poor and not able to learn the same as Whites and Koreans when they started reforming education back in 1994. We need to talk and share information. Each one teach one. Enough is enough! We need to LEAD our people! And we need to learn how to organize. There is too much technology that can be used to organize any form of Civil Acts to let our young people be gunned down, arrested, gassed, and disrespected for this cause. And on the flip side, organizers need a way to make sure that those that loot and/or take advantage of chaotic situations to commit crimes are easily identified. Marching for Justice is a Double Standard!